Lompat Tikam come in 2 layers, green and white. The green one is made from fragrant pandan juice. The white part is made from rich creamy coconut milk. 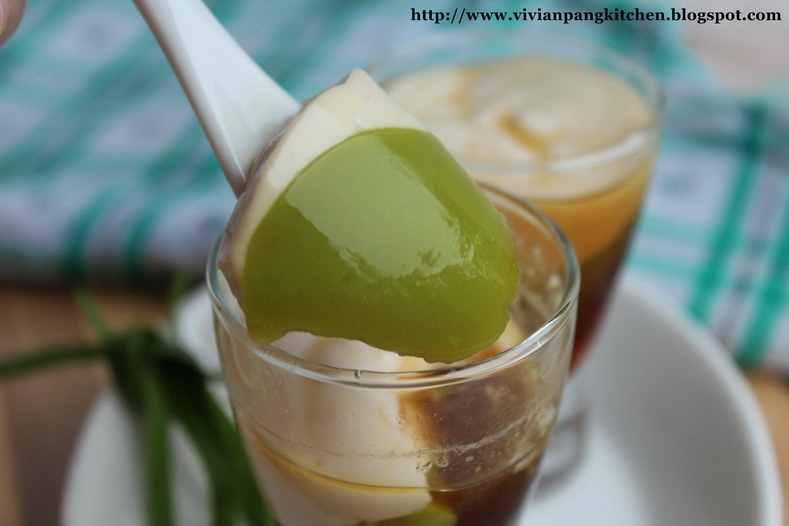 This dessert is served with brown syrup which is made from palm sugar (gula Melaka). As Malaysian we are very familiar and like this combination. Without any hesitate I want to make and try out! Silky smooth texture with brown syrup ....yummy! What are you waiting for? Grab the ingredients and make some for your family. *too much will cause bitter. 5. Chill for a few hours before serve. 6. Prepare syrup: Combine and cook until the palm sugar melts and smells good with pandan. Strain and let it cool down. Chill until time to serve. I'm serving some of my Lompat Tikam in small glasses with 'style' ^^ Want to know how I do it? Just place your glasses like this and keep chill to set before adding the next layer. It is still yummy and delicious by serving them in usual way. ~ Malaysian Food Fest, Terengganu Month hosted by Lena of Frozen Wings. I love how you serve up a traditional dessert in a modern way :) Bravo! Actually the traditional way hoh, is make it firmer, then cut into cubes, and drench with syrup, hehehe. I’m so happy to read this. This is the kind of manual that needs to be given and not the random misinformation that’s at the other blogs. This is a very pretty kuih. Love how you make them. You are so creative Vivian to tilt the cup like that to get the slanted pattern - i was just trying to figure out how to do that :) Thanks for sharing that tip. Gorgeous photos btw! you make them so stylish, very impressed with this !! thanks for your participation, vivian! I love how pretty these are with the 3 layers... you made it so well. I have heard of lompat tikam, but have always thought it is a type of kueh that you could hold and take a bite! Haha, now I know! Looks delicious!